Friday: Birthday kickoff! Drinks and tapas with the girls! Technology is increasingly becoming a more and more integral part of our world and it is very important for our kids to learn how to use it. Fortunately, many kids today seem more adept at handling modern technology than their parents. However, there are many technical aspects to computers that elude even them, such as programming. 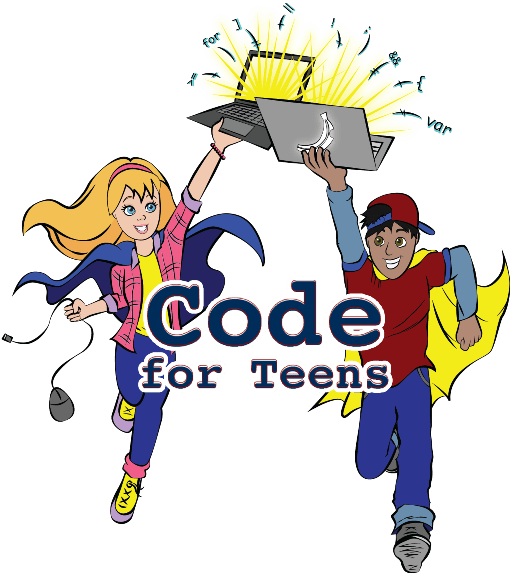 I took my first programming class when I was in college and it was very basic, I wouldn’t even know how to begin to explain the concept to my high schooler. 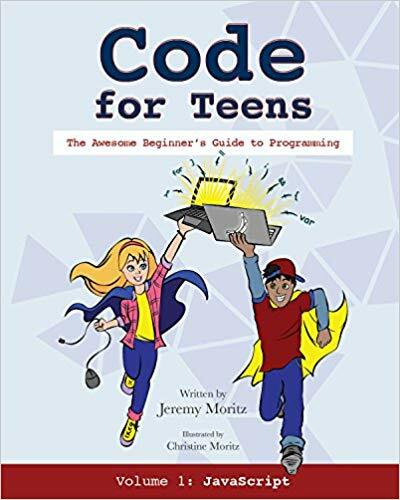 So, I was excited to take a look at Code for Teens: The Awesome Beginner’s Guide to Programming from Code for Teens for this review. As your child moves through each chapter they will complete chapter quizzes, reviews and projects that they will save on the computer in their “workbook”. Answers to these quizzes and reviews are in the back of the book (which is awesome if you are not tech-literate like me). This workbook also gives them a sense of accomplishment as they see all that they have done as they work through the program. The projects are actually fun, and not boring, which my son kind of thought they would be (because, as he told me, most end of chapter projects are). Some of them are similar to logic puzzles, or may involve writing a bio of themselves or some other sort of activity, but he enjoyed them all and there are helpful hints in the back of the book if your child gets stuck (again, thank you Jeremy Moritz for that because I would not have been able to help on my own for sure!). Look, I didn’t enjoy math when I was in school, and I enjoy it even less now. As a homeschool mom, I managed to navigate elementary school math okay, but once we got to the upper level stuff, I knew I was in trouble. So I did what most of us do when we encounter a subject we don’t want to teach, I farmed it out through online and computer courses. However, there are still some times my son needs my help, and I need to be able to help him which means I need some help. 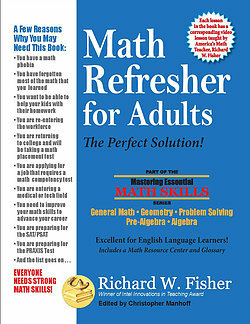 So, for this review, I was happy to check out the Math Refresher for Adults book from Math Essentials. This simple workbook is chock full of information for adults (and older kids) like you and me, who maybe have some big gaps in their math instructions, or just don’t remember it and need a little help. So, getting started, I should tell you this workbook is full of all kinds of problems on all kinds of topics from the very basic like addition and subtraction of whole numbers, fractions, and decimals, to much more complicated things like finding the slope of a line, graphing equations, probability and even (gasp!) word problems! But don’t worry, you aren’t left hanging trying to figure all of this out on your own. Math Essentials gives you access to video tutorials for the lessons led by Richard Fisher on their website and the No Nonsense Algebra website so you can watch the lesson before you try to do the problems. Most of the tutorials are (thankfully) brief, at least from what I’ve seen so far, and that works since I do not have the patience to sit through a 45 minute math lesson. I like to watch the video, pause it, try a few problems, then watch it again, try a few more, and check my answers to see if I’m doing them right. There is an answer key in the back of the book for each lesson, which is convenient, I only wish they showed how they got the answers for some of the problems, but that might be asking a little too much. You could certainly work through this whole workbook if you wanted to review higher math concepts on your own, or you could use it as a summer refresher for one of your students if you wanted. I also think it would be great for some extra test prep as well. If you have just a few topics you need to freshen up on you could easily just go through the table of contents and pick and choose which ones you want to practice (or have your child practice). 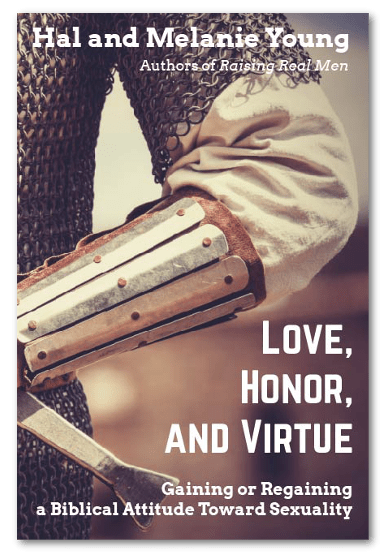 There really are a lot of possibilities for this one, but I think it’s a great addition to your homeschool shelf, especially if you have one or more students who struggle with math. I definitely feel like I am in a better position to help my son with some of his algebra when he comes to me with questions now.